Earlier this month I wrote about how South Africa’s war into Mozambique has contributed to Mozambique checking in at one of the poorest countries in the world. It seems that the apartheid past is still too close at hand to allow Mozambique ample space to regain its footing. Mozambique is supposedly going to increase energy supplies to South Africa to aid in its electricity shortages. What? Mozambique is going to aid South Africa when Mozambique is facing energy shortages of its own and has South Africa to thank for its apartheid debt? 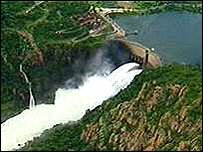 What I later read was that 75% of the energy produced by Mozambique’s Cahora Bassa Dam is already sold to South Africa. The reason for the increase is because the Dam recently received refurbishment that has increased production. Disturbingly, in later research it came to light that the Cahora Bassa Dam was a joint project of Electricity Supply Commission (ESCOM, as it was known prior to 1987), latterly Eskom, Johannesburg, South Africa and Hidroelectrica de Cahora Bassa (HCB), a firm owned 82% by the government of Portugal and 18% by Mozambique. So it is not the government of Mozambique swaying to its former apartheid aggressor, it is the economic interest of two major energy companies one owned by South Africa and the other controlled by Portugal. Where is the voice of the Mozambican people? Why can they not benefit from the very energy that they produce? The answer to that question is all too easily given from the previous statement. The Eskom company is also known by its Afrikans name: Elektrisiteitsvoorsieningskommissie. Now we have arrived at the conclusion that an Afrikans company operating out of South Africa with a known past of the apartheid government decimating the Mozambican population. Did this company gain its assets on the river during the apartheid fueled war with Mozambique? Is the company now profiting from the current and war-time suffering of the Mozambican people? All signs point to yes in both questions. Apartheid is still alive and well in the energy industry of southern Africa. An apartheid era company and the Portuguese, former colonial power, lay claim to the energy supply of southern Africa, Mozambique remains pushed aside, and South Africa gains from the increase in energy where I am sure the wealthy benefit the most. Resources need to rest in the hands of the people, so that the benefit lays in the homes of the people. We who would claim to support and promote democracy need to remember that the Greek, “demos” (prefix of democracy) means ‘the people’ or ‘the poor.’ Those who face the harshest challenges should receive the greatest benefit. I do not see the need for the disclaimer or self-effacement as a suburban white kid…. this blog is a great perspective on a continent. And what it misses can be missed by anyone.